We are a long, long way from a total map of our neurons, but this is a significant step forward. We all learned from our basic biology studies that the brain contains about one hundred billion neurons between the brain and the cerebral cortex. Neurons have tails called axons, where signals travel to other neurons across branching tendrils called dendrites. 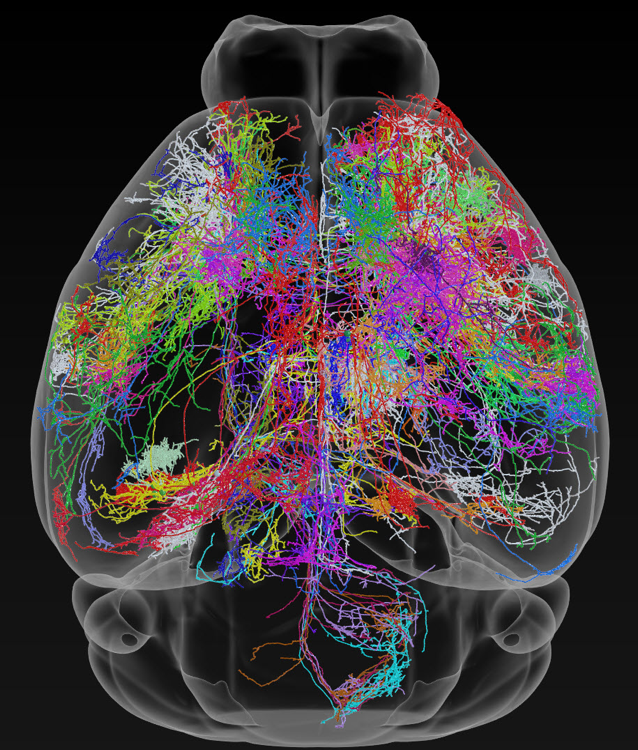 Scientists have long known that this image of neurons is rather oversimplified, and a new tool developed by researchers at the Howard Hughes Medical Institute’s Janelia Research Campus in Ashburn, Virginia has illuminated mouse neurons to show how complex the wirings in the brain are. To do this, the researchers injected a virus that highlights a few dozen neurons into the mouse brain, which they then “cleared” to facilitate light penetrating the tissue. An ultrafast microscope took an image of the highlighted neurons by hitting the brain with pulses of light. Then, a vibrating razor blade shaved off a 200-micrometer brain slice. The entire process was repeated until an image of the entire brain was produced. The Janelia team is presenting the results of their work at the annual Society for Neuroscience meeting in Washington, D.C. on November 13th. The MouseLight project is made possible only through the combined efforts of a “team of highly collaborative, hard-working scientists with a broad range of skills and expertise,” Nelson Spruston, senior director of scientific programs at Janelia, said in an email correspondence with Futurism. Spruston said they call this a “team project” and it doesn’t happen in a traditional lab. One important point here is that the MouseLight project provides us with structural anatomical data of very high quality, which we believe will stand the test of time, because of the rigorousness with which the team ensured accurate labeling and reconstruction of the neurons. The follow-up experiments allow us to go from anatomy to function. So, the MouseLight project is an important piece of a much larger puzzle that will eventually lead to a better understanding of brain function. Apart from improving on the textbook image we have of how the brain works, Spruston explained that their work sets the foundation for a better understanding of some of the most common neurological diseases, including Lou Gehrig’s disease (ALS) and Alzheimer’s.